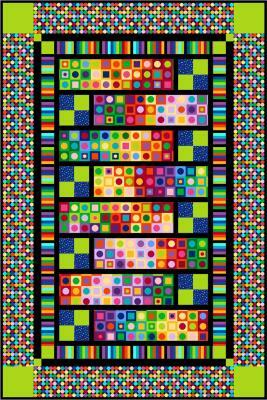 A great new pattern from the girls at Upper Canada Quiltworks Publishing. Nellie Holmes and Christine Baker are the co-owners and designers at Upper Canada Quiltworks Publishing. They have been designing quilt patterns and writing books for over 15 years and between them have a HUGE number of designs. Many of the designs they publish are collaborations with Northcott Fabrics including their four new patterns. Christine and Nellie love working with Northcott and love the challenge of designing with fabrics that are a bit out of their comfort zone. Their new pattern “Modern Vibe” uses Northcott’s ColorWorks Concepts fabric line which is certainly different than what they usually gravitate to. But the quilt is amazing and they found it so much fun to make. Christine quilted the sample on her Gammill with lime green thread and showed her quilting designs on her own blog. This entry was posted in Designers, patterns. Bookmark the permalink.